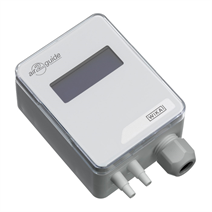 The model A2G-25 air flow meter is used for measuring air flows of gaseous media in ventilation and air-conditioning applications. The air flow is measured by determining the differential pressure and multiplying it with the K factor. The K factor depends on the ventilator used or, when using pipe/duct measuring probes, on the size and number of probes. The K factors of all radial ventilators from common manufacturers are already programmed in the menu of the A2G-25. When using the model A2G-FM measuring probe or a different ventilator K factor, this can be quickly and easily entered in the menu of the instrument. Electrical analogue output signals for both measurement parameters (DC 0 ... 10 V or 4 ... 20 mA; adjustable in the instrument via jumpers) or the digital Modbus® versions enable the direct connection to control systems or the building automation system. The measured differential pressure is also shown on the LC display and transmitted via the analogue or digital output signals. Thus the A2G-25 combines two measurements in one instrument. The LC display and the clear menu navigation enable a time-saving and simple commissioning. With the A2G-25, air flows up to 200,000 m3/h and differential pressures up to 7,000 Pa can be measured.